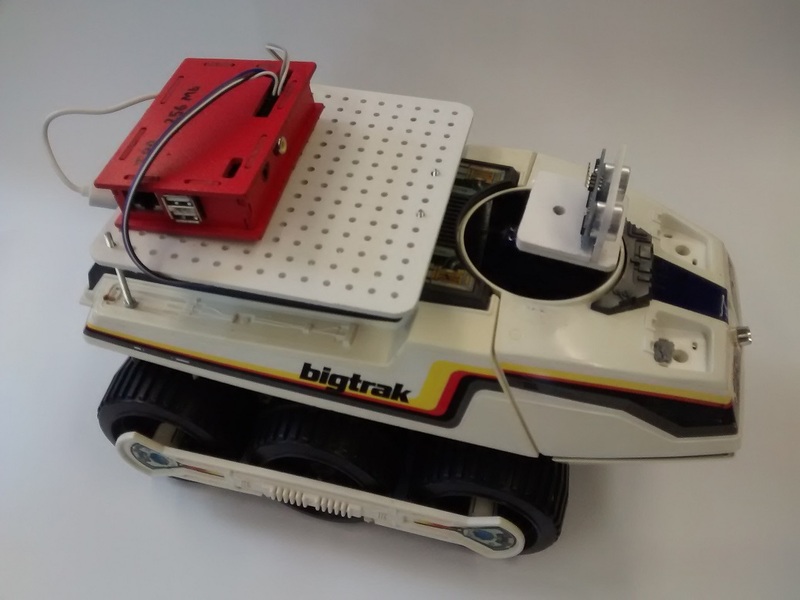 I’ve had an original Big Trak since the late 1980’s when I bought one to connect to my Jupiter Ace. Time passed and it eventually gained a PICAXE and then more recently it gained a Raspberry Pi. The Big Trak electronics are fairly simple to work with, although I have a feeling that the original motors are only rated at 3v rather than 6v or anything higher. I tried a 7.2v battery pack and it went off rather too fast. It’s now running a 4.8v “SubC” NiCd rechargeable racing pack. The motors are controlled by an L298 H-bridge motor which I’ve covered previously. The actual remote control is handled here from a wireless keyboard – the receiver is in the USB slot. I eventually want to make it more autonomous with an ultrasonic sensor fitted on the servo at the front. From a software point-of-view, it’s all fairly simple. The main program is written in Scratch and uses ScratchGPIO to control the outputs. It looks for keypresses (up, down, left, right) and turns on the relevant outputs. The “b” key makes a piezo buzzer beep (useful for warning pedestrians who don’t look at their feet!) and also requires space bar to bring it to a halt. I had originally intended to use my “Flirc” device to control this from a TV handset, but it seems to have died just prior to exhibiting. It partially works but I can’t fully program the keys. A shame, as it also did double duty as a remote for my Raspberry Pi Kodi media centre. The following video was taken by an attendee at the Raspberry Jam in Exeter – I’m not driving either!